Bus rapid transit isn’t much good if it isn’t, well, rapid. Rapid transit routes can’t get bogged down in congestion and still significantly outperform conventional buses. So one thing transit planners need to be sure to address is traffic chokepoints, writes Jarrett Walker today at Human Transit. 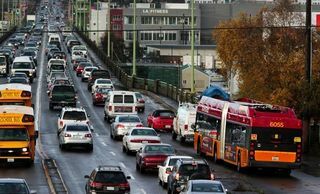 Walker points to the new RapidRide D line in Seattle, which runs in mixed traffic on the most traffic-choked parts of the route and has so far failed to deliver the promised travel time improvements. Severely congested chokepoints are generally expensive places to design transit priority for, especially if you’re unwilling to simply take a lane for transit. So we often see BRT projects that are missing where they are most needed. The Boston Silver Line 4-5, like the Los Angeles Silver Line, can get stuck in traffic downtown. New York’s supposed BRT is so compromised that many refuse to call it BRT anymore. Even the world-class Auckland North Shore Busway disappears as it approaches the Harbour Bridge. Transit agencies sometimes compromise BRT for their own reasons of budget. Issues of boarding time associated with the lack of on-street ticket machines are coming up on RapidRide, as are concerns about reliability arising from the fact that two RapidRide lines are through-routed, transmitting delay from one to the other. These are familiar struggles within transit agencies who are under pressure to spread a product over many corridors and can’t afford to deliver every aspect of the product in all those places. The result runs the risk of becoming symbolic transit; a bright red line appears on the map, but without the investment needed to make good on the promise that the red line implies. Elsewhere on the Network today: Plan Philly reports that a bid to undermine the city’s smart parking reforms ended with re-instituting parking minimums in one part of the city. NRDC Switchboard highlights seven smart growth projects that just won recognition from the EPA. And Greater Greater Washington says overly complex regulations act as a tax on affordable housing where it is desperately needed in the nation’s capital.